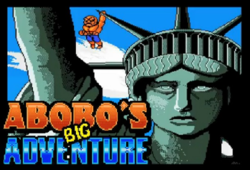 Abobo's Big Adventure is a free online parody Flash game. The game was developed by Team Bobo and released on December 11, 2011. The player's objective in Abobo's Big Adventure is to proceed through different levels of the game using Abobo from Double Dragon to rescue his son, Aboboy. The game itself is split into eight different sub-games that follow one another, each an homage to a particular game: Double Drabobo, Super Mabobo, Urban Chabobo, Zeld Abobo, Pro Wrabobo, Mega Mabobo, Contra Bobo, and Punch Abobo. Each game makes use of the directional keys to control the movement of the character, while the "A" and "S" keys perform functions related to the particular sub-game, such as punching and kicking respectively. This page was last edited on 18 August 2012, at 19:05. This page has been accessed 11,405 times.